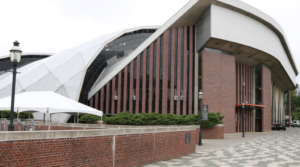 Due to the strong possibility of inclement weather, the Gary Walters ’67 Princeton Varsity Club Awards Banquet, originally scheduled for its usual outdoor location at the Graduate College, will be moved inside Jadwin Gymnasium. The date (Thursday, May 31), start time (5:00 cocktail hour, 6:15 program) and format will remain exactly the same. Parking will be available in Lot 21 and Reunions shuttles will also be dropping off at Jadwin Gymnasium. Click here for the full Reunions Shuttle map/routes. The banquet will honor Princeton’s Class of 2018 and will include the presentation of the C. Otto von Kiensbusch Award to the top senior female athlete and the William Winston Roper Trophy to the outstanding senior male athlete. Princeton announced the finalists for those awards last week. Princeton will also award the Art Lane ’34 Award for outstanding contribution to sport and society by a senior athlete and the Class of 1916 Cup, given to the senior athlete with the highest academic standing. Former women’s hockey player Denna Laing ’14 will be presented with the Class of 1967 Citizen Athlete Award, and Dov Weinryb Grohsgal *13, formerly Associate Dean in the Office of the Dean of the College and currently Associate Research Scholar and Lecturer in the Department of History and the Woodrow Wilson School of Public and International Affairs, will be given the Marvin Bressler Award.